Autonomy has become a trending topic in the world of education. To be honest, the way I hear some people talking about it makes me wonder whether this hasn’t always been the case, really. “Oh, I know it! How about trying to make ourselves, teachers, less needed as students progress in their education?” I mean, seriously? Hasn’t this been the objective of the game from the very beginning? Why do many still look at this as if it were the next big thing in education when it has actually never ceased to be the big thing about it. It’s just like teaching learners how to learn instead of teaching them what we feel they should learn. Yet, one thing that I’ve been thinking about lately is exactly what the role of the teacher is – and how we should play it – in this game of autonomy so we can do more good than harm. If you bear with me for a moment, I’d like to share a couple of things that are still percolating. If we could think of what we’ve been learning as building blocks, and that as we amass information we add one block on top of another, we could have many different layers of information that need to be retrieved and available for use. As teachers, we have two different choices (OK, we have many choices, but I’ll narrow it down to two for practicality issues): we can put the blocks ourselves where we see fit, or we can help learners find out where to better position their blocks on top of previous knowledge. This is where we start facing the very first problem in the differences between teaching by lecturing and learning. Some may believe that information goes beautifully on top of previously stored information. This represents the linearity view of teaching. If only learning were as easy as this. We can't compare our learning to the Empire State building, in which one floor is solidly placed upon the other. "Or the mountains, should crumble to the sea..." Guess what will happen after you leave your learner alone on the 4th step? This is usually what happens when teachers simply demonstrate how to do something by showing rather than guiding. By doing things yourself you’ll eventually take your students all the way up to the 4th stage, but, as they haven’t learned how to do it themselves, they’re likely to end up going back to square one. This time, however, with all sorts of debris on the floor to make putting the blocks back together a more daunting and confusing task. Sometimes we even try to focus on the learning, but we may end up moving too fast too soon. Again, guess what happens when you leave your learners at the fourth stage? Has anyone ever gone throught the but-I-taught-them-that crisis? Here, it is clear that the teacher has showed some concern in helping the learner with the basics before moving on to more complex issues. 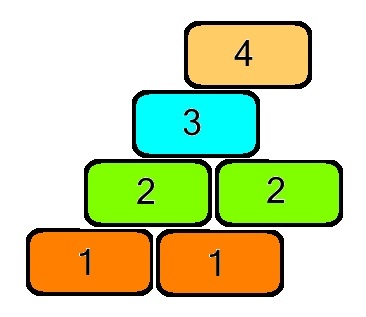 What this extremely simple picture fails to represent is the fact that all blocks are interconnected, and it’s not only a matter of having learnt 1, and then 2, and only then 3. 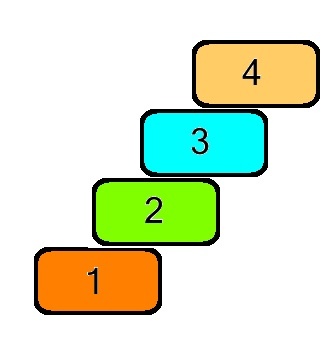 In order to get to 3, we need to make sure that all connections made between 1 and 3 are solid, and that the third row depends as much on the first one as it depends on the second. One thing is still apparent in the picture above, though – learning is taking place from outside to inside. It’s not up to the learner to progress from one point to another, but it’s up to what is imposed onto him by what is dictated by external forces. Instead, we should try and look at it from a perspective in which the learner is capable of being aware of what his or her next step forward should be. The problem is that we cannot see what someone else is capable of accomplishing. We can’t assess competence; we can only assess performance. And this is the part that’s got me thinking. If we can only see performance, how about focussing on helping learners work on the width of their pyramid of learning so they know when and where to place the other blocks? If we work on constantly recycling, and if we truly try to scaffold learning, we’re likely to work on features we can observe, not on features we would like to observe. By having a wider base at the bottom, it’s easier to add blocks at the top. 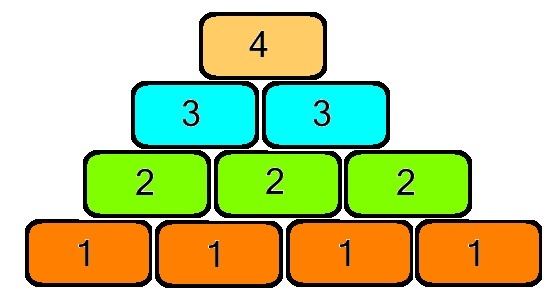 The larger the base is, the easier it is to add blocks at the top. It doesn't get any simpler than that. If you ask me, one of the central tenets of teaching and learning is that one doesn’t take place without the other. Yes, we should focus on learning, and all teaching should only be measured by how much learning it entails. But the key is finding out how to get there. Again, if all we can see is performance, what better way to help learners progress than by focussing on language they produce in order to help them improve what they already know? This is what we are doing when we carefully and actively listen to our learners and make sure we are having a class instead of just a conversation. This is what we do by focussing on emergent language – we make our students aware of what they’re saying and work on meaningful and personal samples of language. If we are constantly recycling and expanding on previous knowledge, we’re likely to help learners build upon their own knowledge independently. How do we become good at something? How do we develop a skill? Only rarely will you see someone being able to excel at something they’ve never practiced and rehearsed before. Before you can run, you have to learn how to walk. Before you can play a Bach’s piece, you need to learn the musical scale and know how to play each one of the notes. Before you learn complex issues, you need to learn – and practice – the basics. If you practise and recycle enough, you’re likely to progress much faster as having the knowledge of the most basic things will help you understand how to get to the complex parts. Perhaps we’d be doing more by focussing more on the individual and the process than focussing on the product. I’m sure most teachers are aware of that. Unfortunately, I myself know many who can only talk the talk, but not walk the walk. How about you? Fantastic post, Rick! I find it very relatable that you suggest that this autonomy be what has always been the goal of teaching when it seems to be surfacing loudly now. It seems to me that something becomes the buzz to discuss at one particular time in our industry, but that doesn’t suggest it hasn’t always been there, just we tend to rotate around specific aspects to bring attention to. This is one for the moment. Another that many of us do will be tomorrow’s. One group of building blocks is all connected to each other, building together to a point where we leave them to their own devices. It’s us who demonstrate through connected activities that when approaching future tasks, students are able to make this vital connection between past processes and new tasks in order to establish how to go about achieving the new #4 without teacher support. If this process, connection or transferability isn’t worked on with students, their future successes will be hampered. First of all, many thanks for a comment which complements the post. Transferability is definitely another major interest that, if people still haven’t spotted it, is the result of teaching for learning. Once we have been taught to learn how to learn, we can apply this knowledge in many different areas. I don’t think your students are alone in struggling with this concept. Perhaps it’s a matter of the computerized society we live in these days in which you have a process for each operation, but apparently very little communication between them. Maybe it’s time we started being more explicit in showing them how to connect the dots and then, little by little, give them more autonomy in this process. I’m not sure I agree that computerised processes are mutually exclusive. In fact, I often argue that if you know how to insert an image in WORD, you can very easily apply that knowledge to doing so in other Office programs, a BLOG, a WIKI, or any series of other areas. A lot of processes online come from one fairly standardised and accepted method. Otherwise, it would be too much of a cognitive load. No? You most certainly have a point there. However, I wonder whether students are aware of how transferable these process are. I think they need some explicit intervention, even if it’s just to tell them to do exactly what they did in another office program, more often than we usually take for granted. I’ve had the chance to work with students who use Facebook, Word and other programs and platforms pretty much all they long, but who still couldn’t realize that adding an image to a wiki page was very similar to what they’d done in other programs. Go figure… no extra cognitive load, but they needed to be told that it was exactly what they used to do. Henrick. Taking a step back on the question of autonomy. It has been questioned by some if learner autonomy is possible at all as it seems to depend on the motivation of the learner. If the student is studying because they HAD TO they were less sensitive to the teachers this autonomy-supportive practice as I think you have explained above. So what this might mean is that you won’t get students becoming autonomous if the their own motivational conditions are not there. Think of some of your teenagers for example. When this motivation is in place, then the learners can be more understanding to the less controlling nature of a teacher instruction whose aim in autonomy. It may not matter what style of support or instruction a teacher gives because some learners won’t want to become autonomous. I think it is written in a Zoltan Dornyei book, who has done much research on ESL learners. I’m trying to find his excellent book on Psychology of the language learner (if you don’t have it I would get it) which came out a few years ago. I think he says the same thing in his other book on Motivation too. There are a few papers one he did with ‘Tseng’ that I used for motivation questions at different stages of my research study. Also very good. I think a more realistic target that you can set teachers is that they give help their students make more autonomous chioces in their learning, giving their learners options and seeing what steps each learners too when they took this decisions learn. As you said it is very individual, so different individuals can make different chioces. The process is then dependant on the learners perfoamnce and them being able to reflect if the chioce they made was postive to their learning. Then they are likely I belive to start making other chioces and become more indpendant and aware of what their needs are rather than the teacher. Many thanks for such a thorough comment. I cannot really argue with you on the point of motivation, which is what guides us through life, I suppose. This is probably the reason why so many teachers are concerned about students’ motivation and keep trying to affect motivation by extrinsic factors. Motivation comes from within, and it is something that is unique for each and every one of us. We sometimes may end up inspiring someone, but this is unlikely to happen in all cases. However, even motivated leaners may suffer from classes in which the teacher is not aware of the dangers of faulty instruction and has never been interested in teaching and learning in the first place – I think you’ll agree with me that there are plenty of “teachers” out there who are able to ruin it even for highly motivated learners. On a second thought, we are usually motivated by things we are able to do well. This means that by being able to, say, play football well, we’re likely to enjoy playing football. On the other hand, if we are lame at football, we’re very unlikely to spend our weekends doing that activity. This means that, maybe, the best way for us to work towards fostering autonomy is by properly being able to scaffold and show learners how much they’ve progressed. Feedback? Yes, please. But also setting realistic and attainable goals might do the trick. Finally, I agree with what you said in your last paragraph – we should, as teachers, give learners more responsibility in making their choices and also teaching them how and why such choices are important. I can see the power of your image, in fact very recently one of my students when asked to pick a photograph to describe their experience of learning English picked an ancient Inca pyramid. then there is the problem of the skills approach/hypothesis(krashen) to learning a language which the ‘pyramid’ image connates even if it less pronounced than the first image of the vertical stack. maybe tyson’s near circle type figures implies more of a comprehension approach/hypothesis? I guess the pyramid format is very limited in many ways, but it’s still something we can’t exactly deny for at least some aspects in the learning process. I’ve been thinking about other more comprehensive approaches to the picture and graphics to better illustrate a broader concept. Thank you for this thorough and well thought-out post. You seem to have given a lot of thought to this issue, uh? I get the sense that basically what you’re saying is: Teachers ought to get better at identifying students’ zone of proximal development – their level of readiness, if you will – and making timely interventions when the need arises. This sort of “point of need” scaffolding will enlarge the base of the pyramid and this will, in turn, hold students in good stead to continue adding new blocks on their own. This premise does make a lot of sense, I think – assuming my take on what you wrote is minimally accurate. Helping teachers intervene in a natural, clear and effective way should be tackled much more systematically in training courses all over the world and it’s a shame this rarely happens. Instead, we’re still left with the early communicative era paradigms whereby during accuracy activities, the teacher ought to correct and during fluency activities he or she should step aside, delay intervention etc. Surely things are not as simple as that, not least because some of the most significant scaffolding a teacher can do will happen during meaning-oriented (fluency) activities. But I digress. There are two things about your post that I still need to give some thought to. 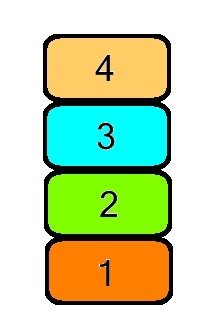 One, to what extent is a pyramid made up of numbers any less linear than the first models you presented? After all, you’re still proposing that students move from one to four, right? So, one could misread your post and assume, for example, that 1 = “easy” structures and that these ought to be mastered before students move on to 2, 3 and 4. I know that’s not what you’re saying (you’re talking about emerging language being restructured via teacher intervention, right? ), but the fact that you’re using numbers laid out sequentially is slightly at odds, I think, with the essentially organic nature of the system you’re proposing. Two, to complicate things further, how readily should we commit to a language-learning as a skill-learning model? This is genuine, rather than rhetorical question, Henrick, which, incidentally, I keep asking myself over and over. The analogy you’ve used (musical instruments) has a certain intrinsic appeal that I find irresistible, you know, not least because it reflects much of my own experience as a learner and teacher. But this analogy is as appealing as it is contentious, isn’t it? What about the stuff that gets picked up naturally, incidentally, organically, without any sort of overt teacher intervention / mediation? How would this model accommodate it? What number would it be and how firmly etched at the bottom of the pyramid would it need to be to equip students with the tools they need to move forward on their own? So the question I’m going to bed with: would any other sort of shape / layout perhaps be more compatible with the tenets of your very sensible model? Thank you for all the food for thought. Your so-called digression also touches on a much talked-about but not acted upon issue, which is that of teacher training. But let’s leave digressions aside as this can be the source of another post, right?! As for the second, genuine question, I think it is yet more complicated than an either-or thing. Skills are part of language learning and they certainly help us with assessment, but they’re far from being the only aspect involved in teaching and learning languages. Incidental learning and others are, up to a certain extent, beyond our control. What we can do is making sure we are equipping learners with the necessary tools to maximize incidental, more organic learning. Another shape/model… Working on this as well. The beauty of this connected community is how fast it leads us to reflection and how easy it is for us to see that what is so clear in our minds is not exactly clear to others. It’s definitely a lot easier to make changes on these grounds. Thanks for the food for thought your comment has provided me as well! Interesting reflections, Luiz Otávio… I wonder if a web-like network model for language acquisition would be appropriate, with the student in the centre and different lexical categories (and world knowledge, why not?) closer or further from the centre, according to the sequence in which Ss are exposed to language. I’m thinking of those Ss (we’ve all had them)… who may do a lot of their language learning OUTSIDE the confines of a classroom and a coursebook (which tend to have sequential syllabi), but rather surf the net, listen to music or play video-games as their main source of exposure to the L2. In this model, these already autonomous learners may well be exposed to more complex lexical chunks (such as the language of World of Warcraft, for example, or highly idiomatic expressions from rock/pop songs, phrasal verbs etc, before they are ever formally taught about irregular past participles, reflexive pronouns, present perfect etc etc etc). From a cognitive psychology point of view, this model of a neural network, where words are interconnected and may be either top-of-mind, i.e. tip of the tongue for active production, hence closer to the centre… or deep in the vaults of receptive vocabulary.. and represented on the perimeter of a network model. Hmmmm… your blogpost certainly provided plenty of food for thought, Henrick… and I haven’t even touched (as others have, very competently) on the whole issue of the teacher’s role in scaffolding learning. I did like the idea of the web-like network to better represent the model. If this is carried out language-wise it makes a lot of sense to me. The fact that a web still stands if you break some of its nodes is also very representative of what happens with those students you mentioned. Their understanding of certain aspects of the language is stretched beyond what the logical (?) steps would lead us to believe in. More and more learning is taking place outside the classroom for many English language learners in the world, but there are many more who are yet unprepared to take advantage of all the opportunities which are presented to them. This is where teaching comes, isn’t it? Allowing learners to take advantage of learning moments outside the confines of the classroom is on of the goals in this new era. Perhaps we’re going back the the idea of transferability that Tyson mentioned earlier on? Many of the complaints I hear about it, is that it is turning Education back to teacher-centered classes. I think the reason it happens is fundamentally connected to the ability of the teacher to foster an autonomous environment: online or offline. Like usual: the core of the problem is not actually technology per say, but methodology and have a defined goal to classes. Whereas technology has a lot of potential to generate some autonomous light in Education, it will not do the work by itself. Since, “Hasn’t this been the objective of the game from the very beginning?”. Agree that autonomous learning is our goal. Therefore,it doesn’t matter if you put technology (or any other educational trend) around it; as long as you use it to get there, not to get somewhere else. Many thanks for stopping by and leaving your comment. We do see eye to eye on this matter. Technology is yet another tool – actually, one we’ve always had at hand if we understand technology as going beyond computers and Internet – for teaching. It’s not the tool, it’s the use you make of the tool. Should you give a lousy teacher the best material in the world, the lesson would still fall short of expectations; should you give an outstanding teacher nothing to use, learning would still take place. The point, as you well said, is that technology won’t do things on its own – a misconception that seems to spread easily around those who are against its use in education. Unfortunately, there are still many of those working in departments that make the decisions.